Ah, the “Mashed Potato Martini”, the symbol of swanky 1990’s catering. 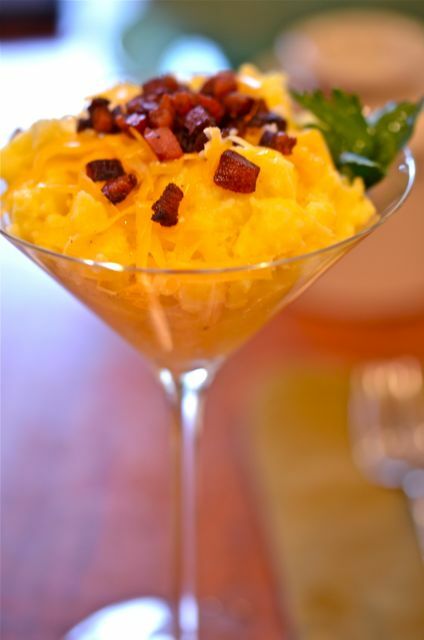 A cocktail glass brimming with buttery mashed potatoes and topped with your choice of butter, sour cream, bacon, cheddar cheese, chives and parsley. A pleasant, if somewhat excessive, relic of the dot-com era. But just as the excesses of dot-com left some valuable companies and technologies in their wake, the mashed potato martini left us with a valuable legacy, we got serious about making “perfect” mashed potatoes. And by “perfect” we mean, tasty, easy and predictable. And a recipe that easily scales for large events. After a few years of intermittent experiments we developed this recipe / process and never looked back. 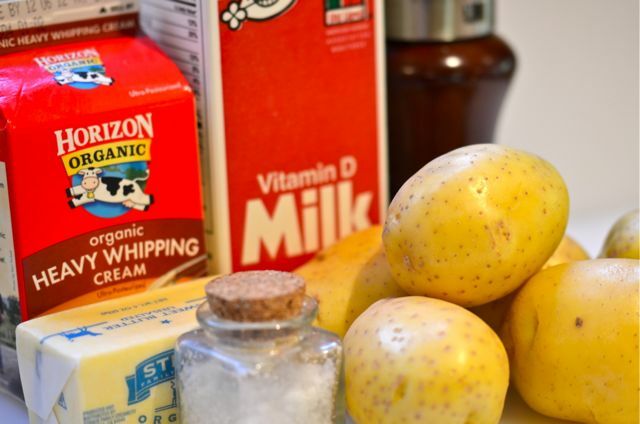 The basics are simple, we use Yukon Gold potatoes and plenty of cream, butter and salt. And we have just a few techniques that make a big difference in texture. And, of course, we add a plenty of extra butter, bacon, cheese, etc. We just don’t believe in “light” or “healthy” mashers. We save that for kale dishes. 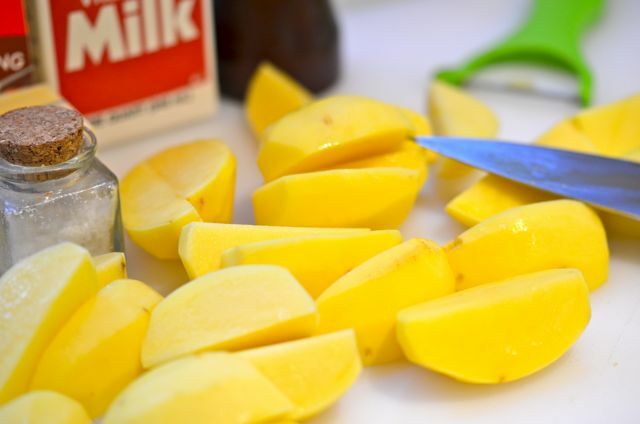 As for the ingredients, the main difference is using Yukon Gold instead of starchy Russet potatoes. The Yukons are a mix between waxy and starchy potatoes, and they have an overt “buttery” flavor. The big advantage of the Yukons is that they don’t dry out like Russets. So while you do need cream and butter, the Yukons add their own moisture without being watery. You get a creamy texture and pronounced potato flavor to match the dairy and salt. Good stuff. As for the key techniques, they are also very easy, but important. Firstly, after you drain the potatoes, put them back in the hot pot and mash with the warm dairy. The hot pot dries out any extra water (you don’t want watery mashers). Secondly, only mash just enough with the masher and then move to folding with a spoon. Too much mashing makes for a gluey texture, better to have a few lumps. And finally, have extra butter and milk ready to mix into the mashers if they seem stiff or dry. And feel free to keep adding butter…hard to go wrong. Then adjust seasoning, serve with more butter on the side and you’re done. All in less than 30 minutes. Perfect. And if you want to be “fancy” there are a few other steps you can take. If you just hate lumps, you can run the mashers through a fine mesh strainer to get a very smooth consistency (if you do this, you may as well add as much butter as you can- like a mousseline). And lastly, if you want to pull out the martini glasses and add a bunch of garnishes you may get a few extra smiles at the table. A slightly ridiculous, but also delicious, dish for the “holidaze”. Yukon Gold potatoes are widely available. 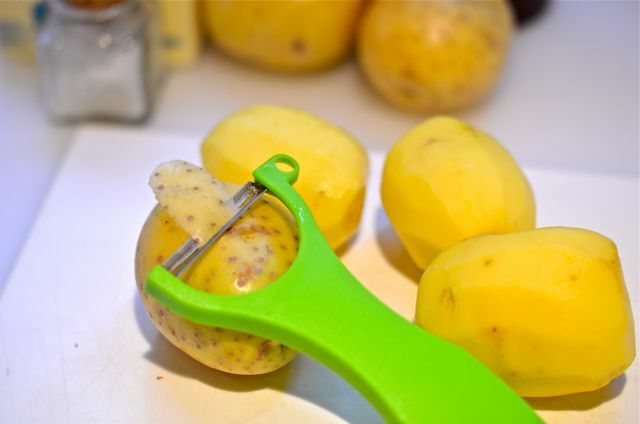 Use the largest Yukons you can to save time on peeling. This recipe is for 4 – 6 as a side, but scales easily for larger groups. What You Get: Like we said, perfect mashed potatoes. What You Need: A potato masher, or a ricer. But the masher is the best tool for this recipe. How Long? About 30 minutes, with 10 minutes of active time. This is an anytime dish. Garnishes like butter, sour cream, crispy bacon, cheddar cheese, chives, etc. Place the potatoes on a medium, lidded pot. Cover with water, add the teaspoon of salt and bring to a boil. Then lower the heat to a simmer, cover the pot and cook the potatoes for 15-20 minutes or until a fork easily pierces the potatoes. 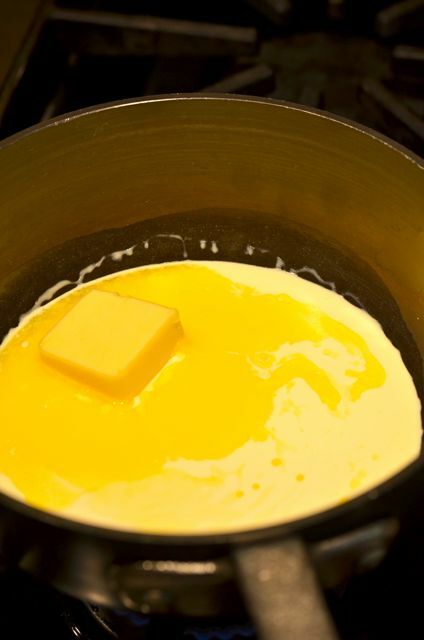 Meanwhile, add the cream, butter and milk to a small saucepan and warm over low heat. When the potatoes are done, remove the pot from the heat. Drain the water from the potatoes and then place the potatoes back into the warm pot. Add in the warmed cream, butter and milk and mash / mix with the masher. Mash just enough until most lumps are gone. 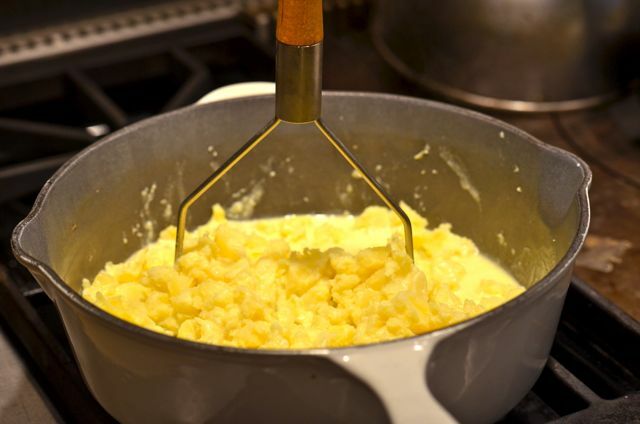 Then gently fold with a spoon to complete mixing the potatoes and dairy. Taste and adjust for seasoning and texture. If too dry, gently fold in more butter and small dashes of milk. Serve with butter and your choice of garnishes. I will have two please. I am a mashed potato lover. There are so many schools of how to make them, don’t over beat, beat them to death, sour cream, no sour cream…. These are something new, at least to me so have to give them a try. You’re very good at this culinary artistry work! Mashed Potatoes are my all time favorite food, comfort on a fork, these look yummy! What a great idea! You are so creative!! I want to eat at your place. I LOVE the idea of mashed potatoes in a martini glass! Yukon Golds are the shiz. Perfect mashed potatoes every time! We will take a pint glass of mashed potatoes anytime…. 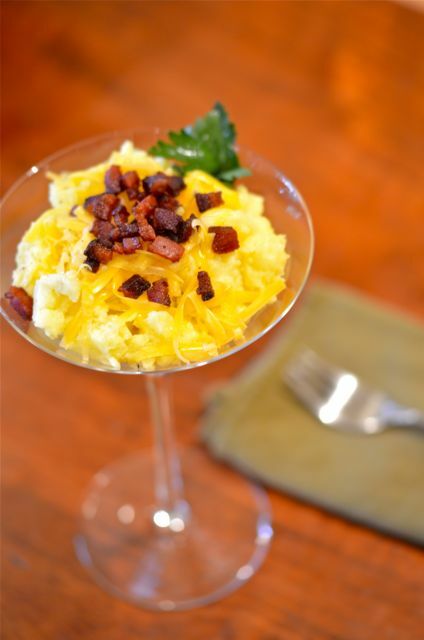 I’ve never even heard of a Mashed Potato Martini, but I love the idea! Thanks for posting this great recipe. These look fabulous! Pairing together two of my favourite things… Mash potato and cocktails! 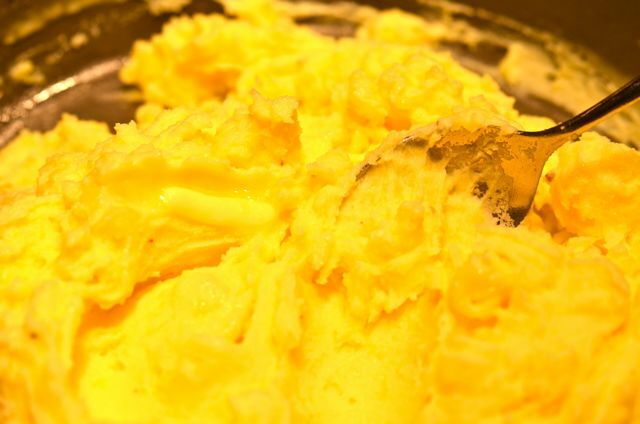 I must admit my mash potatoes probably contain more butter than potato… But you can never have too much butter! And the creamy smooth resulting consistency is just heavenly… Ooo I am making myself hungry! The martini glass is a nice touch to fancify a home classic. Nice tip about mixing the potatoes in the pot so that the heat dries out some of the extra water. The mashed potatoes look great. The martini glass, not so great. I’d eat ’em anyway. I make my mashed potatoes exactly the same way. A little more butter and cream for company, a little less when it’s just for my family :). I am hosting a Holiday party (heavy apps/small plates) in a couple weeks and want to serve a braised short rib appetizer. I would love to do it over mashed potatoes (maybe in ramekins? ), but I’m not sure how the potatoes would hold up since I will have to make them ahead of time. Any thoughts on this? Thanks!! Hi. A few things. 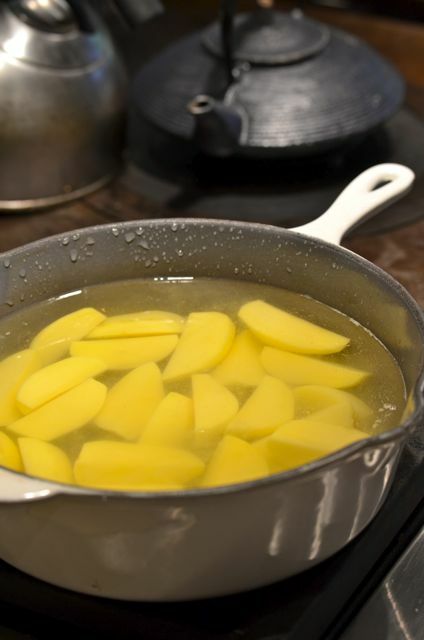 The potatoes can be made a day ahead and reheated in a bowl over simmering water (like a double boiler) or in a chafing dish with no impact on quality. And shredded short ribs are perfect accompaniment to the potatoes (we know a caterer who features a similar dish- and in ramekins or little cazuelas). The dish should be a hit. Ooooh…chafing dish…good idea! I can finally use the one I have stored in my garage. Thanks for the tip!